Though I generally spend my knit textile design time playing with wild textures, this group happens be more subtle. I've still got the texture making bug, but I just can't show what I'm working on at the moment. If you're a machine knitter, I'll be sharing some of the technical details of these fabrics on Knitting in the Fastlane soon. So this is knit, and there's always going to be some texture. 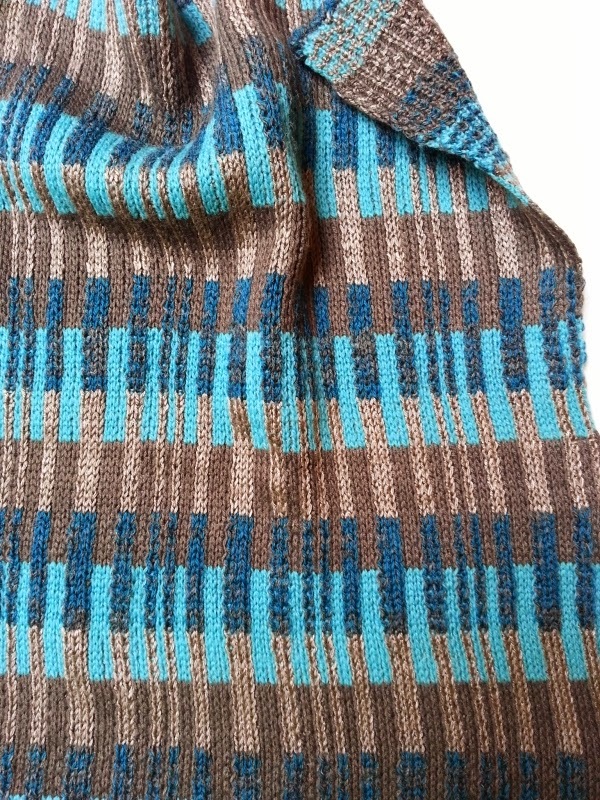 The top and middle photos are both birdseye knit and the fabrics are heavy enough for a jacket or coat. I love that it's double knit, so there are no floats. I'm kind of on a black and white kick again; for the top fabric it's black and vanilla. I love the big, crisp contrast. I also thought it would be fun to group columns of squares with columns of a (pixelated) tapestry. I posted the fabric below on IG and FB a little while ago. It's softer than the black and vanilla fabric in a couple of ways. 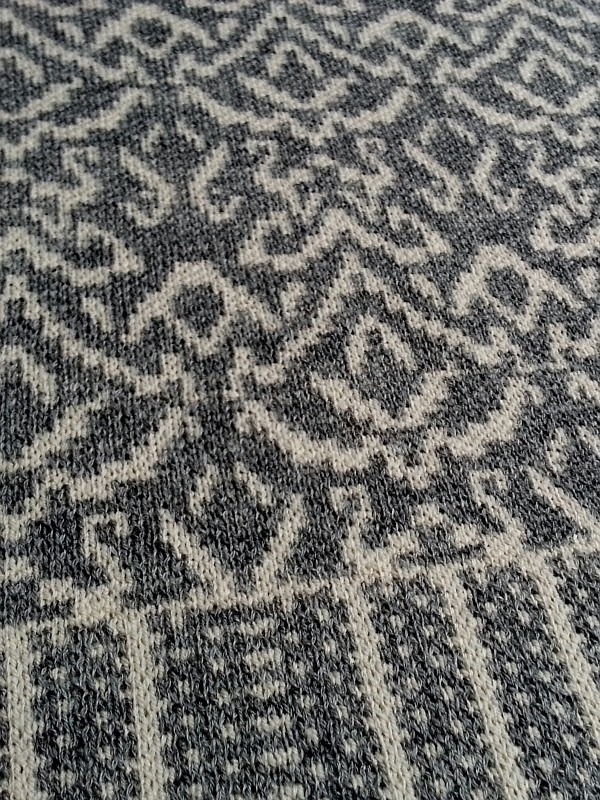 The greys make this tapestry-like knit have a softer look. And if you could feel this fabric, you'd be surprised at how soft it feels. I'm not sure you can see this in the pic above, but the deeper grey yarn has a heathered look. That's because the yarn is actually a blend of tussah silk and merino wool. Since the fibers accept dye differently, it gives any fabric made with this yarn a wonderful richness. And believe me, a silk/ merino blend definitely feels rich! The next fabric has lots more drape. I keep seeing it as a pencil skirt, but it would make a nice tunic length sweater. The thing is I also like the reverse, so I think I'd have to choose something where both sides would show. I'm sure by now you know I love textiles. I'm fortunate in that I can make my own sweater knits, but there are so many other fabrics I love -- brocades, devoré, lace, all sorts of embroidered and embellished fabrics, and more. I do think of each as a finished object., but I also love imagining and seeing what they can be become. What are your favorite fabrics? :-D A silk-linen blend does sound wonderful! 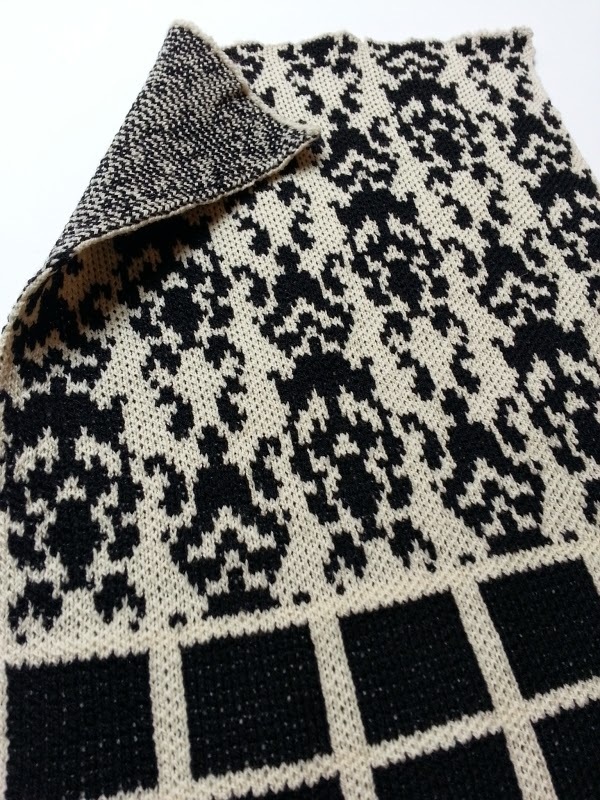 I'm a huge fan of black-and-white prints and this sweater fabric is gorgeous! I love your designs and color choices. I must ponder ideas of what to make from sweater fabric and a sewing machine.